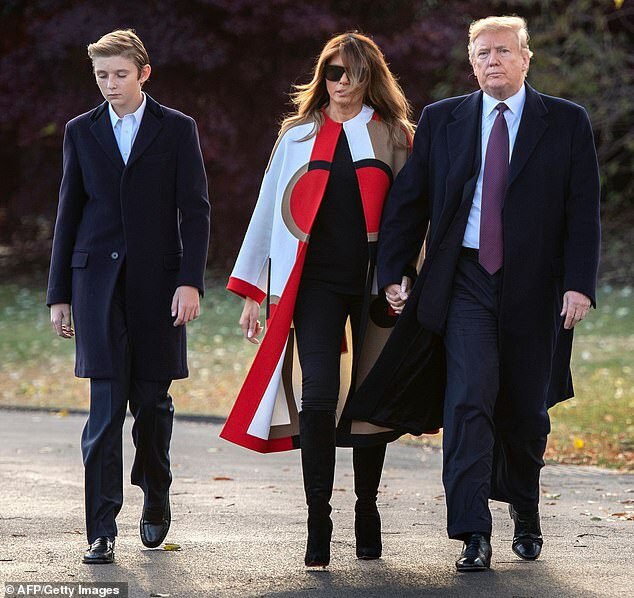 The Trump family has debuted its annual holiday card and Christmas Booklet ahead of the festive season, which includes directions for how people can mimic White House cranberry trees for their own decorations. 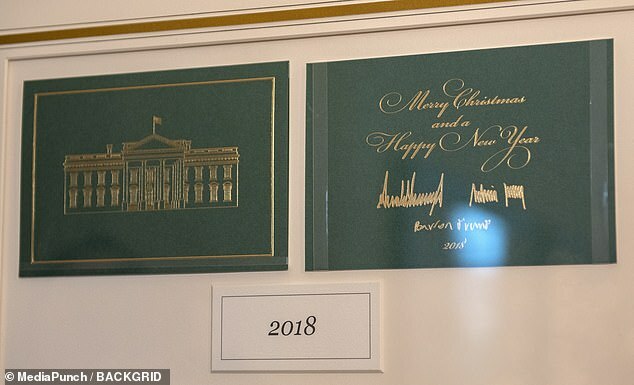 This decision first came about after Trump, 72, made it clear last year that there would be no ‘happy holidays’, which is more generic and politically correct statement, on any of his family’s festive cards. 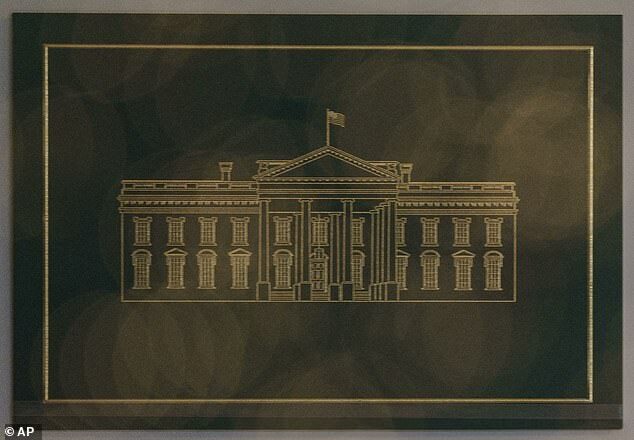 This year’s holiday card comes on forest green card stock with a gold image of the White House on the front. 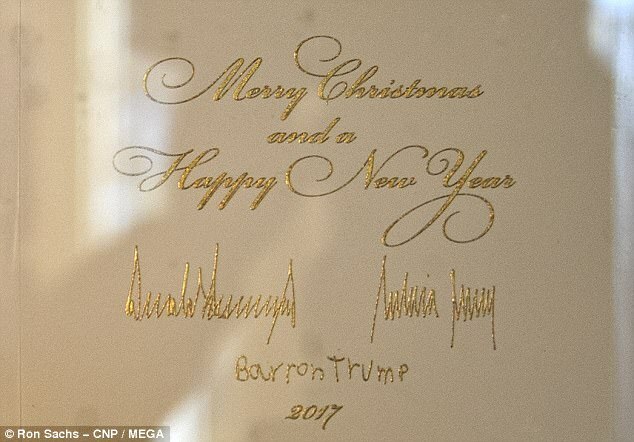 Inside is the same message from last year with the President, Melania Trump and Barron Trump’s gold signatures underneath. 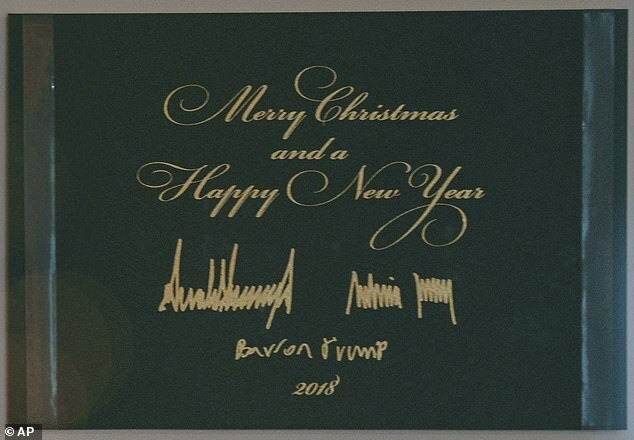 The card this year differs from that of last year because it had a the presidential seal on the front in gold and was on a cream-colored card stock instead of forest green. As per tradition, the White House also released a Christmas Booklet that visitors will receive upon touring the home during the holiday season. 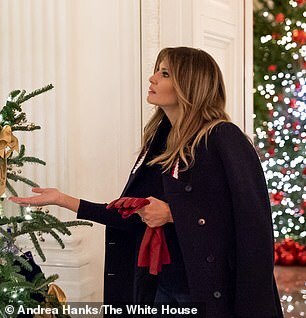 DailyMail.com can reveal inside this year’s Christmas Booklet includes directions for how people can mimic the cranberry trees featured in the East Colonnade of the White House when people visit. 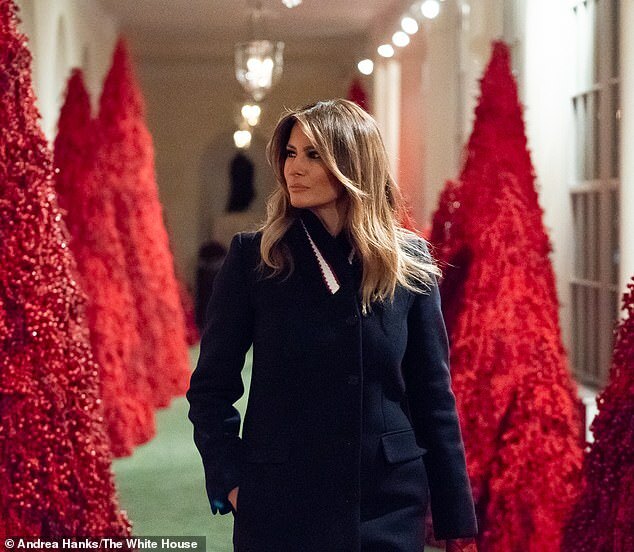 First Lady Melania, 48, along with staff created 40 red Christmas trees made entirely out of cranberries to adorn the East Colonnade. 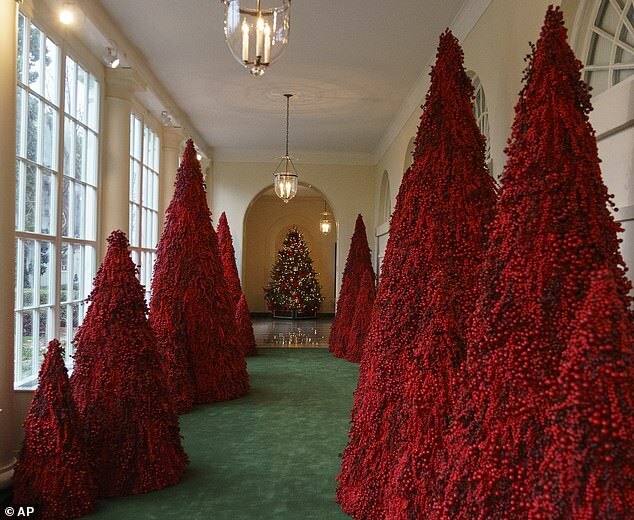 This type of tree, according to the Christmas Booklet, was first introduced in 1975 by Nancy Reagan who loved the color red. 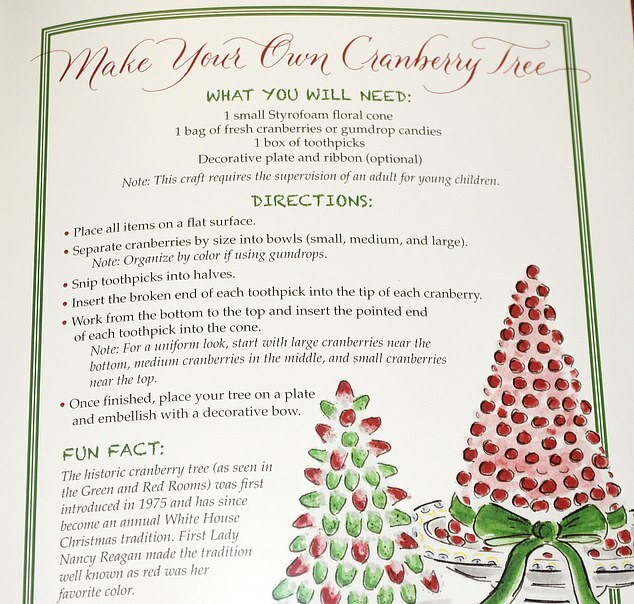 But now people can follow the provided recipe to create a table-side cranberry tree that includes gumdrop candies and fresh berries. To create on ones own, the White House advises purchasing a Styrofoam floral cone that will serve as the base for the small tree. Then people can use cut-in-half toothpicks to place cranberries and gumdrop candies throughout the cone in whatever pattern they please. Once the exterior is finished, the booklet advises for people to place the tree on a decorative plate and garnish the bottom edge with a bow. 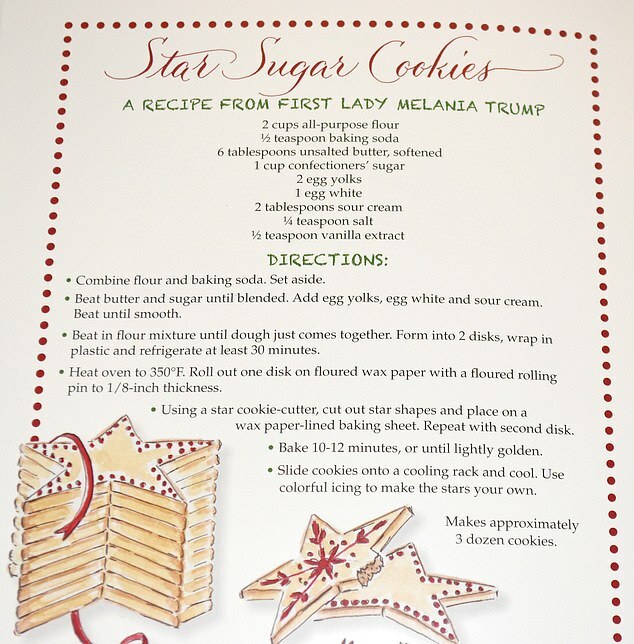 Melania also included her own sugar cookie recipe in the booklet for visitors to make in their own homes after visiting the White House. The recipe is rather similar to most sugar cookie recipes but includes the addition of sour cream in the batter. Incorporating sour cream into the mixture can help provide moisture into the cookie dough as well as create an airy texture for the baked good when one finally gets to bite in. Melania recommends cutting the cookies into a star pattern before baking. After baking, the recipe says the stars can be decorated with whatever icing the person wants to complete the sugar cookie. The White House shared the pictures and videos of the new decorations on Monday ahead of the official tree lighting in Washington D.C. on Nov. 28. It was also revealed that the theme for the decorations is ‘American Treasures’ and focuses on the patriotic colors of red, white and blue.